Gluten-Free Girl and the Chef: Potato Pancakes, Please! potato pancake, originally uploaded by shaunaforce. “Hey honey, do we have any green onions?” the Chef calls out from the kitchen, as I am sitting at the computer, writing. These are mornings around our house. Even though I have enticed the Chef to eat hot cereal a few times a week (and perhaps even educated him into doing so, since he never ate a whole grain before he met me), I know he is never excited about those breakfasts. Those are the mornings he is happy that I am preparing our repast, the mornings he can read the newspaper in bed and wait for me to bring breakfast to him. Still, his favorite mornings are when he stands in the kitchen about 10:30, slowly turning to survey what we have on our shelves and in the fridge. His eyes go wide, and he can’t talk for a moment. Then, he dives right in. Sometimes, he needs something in particular, like a few mornings ago, when he requested green onions. Thank goodness we have a cozy neighborhood grocery store across the street from us, or I would be perpetually driving places before noon. I slip on some jeans and amble through the aisles. Every checker there knows us, and each one smiles and asks how it’s going. “What’s he making today?” the girl with choppy black hair and a sarcastic smile said to me the other morning. Sometimes the food the Chef makes up on the spot ends up on his menu the next month. He has this uncanny knack for knowing what flavors will mingle together, building on each other, ready to silently explode in the mouth. He loves playing with his food. Before he met me, and he lived alone in an apartment downtown, he never cooked at home. After cooking all day long in a tiny restaurant kitchen, the Chef left his work at 11 pm and often stopped for (gasp — the horror) a Subway sandwich. Now, we eat full-course meals at midnight, and he always has a smile on his face. Before he met me, the Chef never ate breakfast. He walked around perpetually hungry, nibbling his food, tasting to make sure it came out well, never feeding himself properly. Now, he starts off the day right. He eats a beautiful breakfast at our little table, looks out the window at the Olympic Mountains, then looks over at me, enjoying the food he has made us. And the green onions? That morning, he needed them for potato pancakes. They arrived before me, unbidden, on our blue-and-white plates, hot from the oven. I swooned. “Hey, you want to marry me?” I said, giggling after the first bite. “Yes, please!” he said, then took a forkful of his eggs-over-easy on top of a bite of potato pancake, and chewed his food with pleasure. For years, I thought potato pancakes were beyond my ken. I didn’t quite know how to make them, and the few times I attempted them, they came out soggy. After I learned I had to live gluten-free, I gave up on potato pancakes. There are other foods in the world. But the Chef is teaching me, every day, that almost every food is easy to make, as long as you listen to the flavors and truly pay attention to what you do. Peel the two potatoes, then shred them on a grater. You want these to be medium-to-large shreds. (Don’t use a microplaner, for instance.) Put all the grated potatoes in a nest of paper towels, then squeeze as much water out of them as you can. Go back again and wring out more. When they are as dry as can be, place them in a large bowl. Turn a burner of the stove to high heat. Place your favorite skillet on it and bring to heat. Put all the ingredients in the large bowl. Mix them up with your hand, squeezing and turning it all, fast, until everything is combined well. Form the potato mixture into little cakes, about the circumference of a good coffee mug, approximately one-inch thick. When the skillet has come to its full heat, put two tablespoons of good-quality olive oil in and turn the burner down to medium-high heat. Add the potato cakes. After a minute or two — or when the underside of potato cake has browned and you start to smell the warmth of it — flip the cakes over and brown the other side for one minute more. Immediately place the skillet in the oven. Cook the potato pancakes for ten minutes or so, or until they are browned and smell so delicious that you just can’t wait another moment to eat them. Shauna, I adore you. This made my mouth water and as I read your voice was so strong I could literally hear you reading it, it was the coolest thing. I miss you so much! I think I'll have to give potato pancakes a go this weekend too, AHHH!!! I miss you!! I adore you too. Oh dear, all of Sitka just came rushing back at me, just from seeing your comment. I'm certain that you are living as awake and beautifully as always. If you make potato pancakes, write to me and tell me how they are. I'll try these pancakes. I often make "rösti", a traditionnal Swiss recipe that resembles your potato pancakes except without corn starch. It's just shredded potatoes and you can add whatever you want such as cheese, bacon, zucchini (shredded too).. It's easy and delicious! oooh, that sounds so delish. Here via a friend who sent me a link to your site with the instructions to enjoy the great writing, and positive vibe. I've been doing so for 3 days now, and am hooked! Thank god potatoes are GF! Oh how I love potato pancakes! Those look great too, and if I had not just eaten breakfast, I'd be making those. Hash-brown potatoes are also quite welcome by me. mmmmmm, i just had your potato pancakes for lunch...(looks around to check my Mum is nowhere in sight)...absolutely the best potato pancakes I've had! I did add an egg into the mix though, as a nod to Mum's oiginal recipe. Good on ya Mum. I love reading your blog. I was diagnosed with Celiac several years ago and thought my love affair with food was forever gone. You have inspired me to return to the kitchen. I look forward to purchasing your book. Please continue feeding us with great recipes and stories. 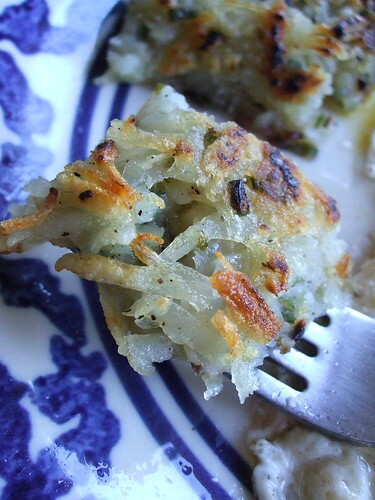 Now see, to me, these are hash browns...potato pancakes look more like...uh, pancakes. This is Chelsea(from KEN'S) and I just wanted to let you know the site is AWESOME. I am glad to see good people doing so well. Send my best to the CHEF. Isn't the way I write about the boy schmaltzy enough? That sounds fabulous as well. In fact, I love potatoes so much that I could do an endless variation on this same theme and never be tired of it. Thank you for coming over, and I hope you keep coming back! Positive vibe? oh, there's plenty of that these days. I know! Thank god potatoes are gluten-free. I don't think the Chef would marry me if I couldn't eat potatoes! Thank you so much. If I can inspire anyone to love food, then I'm happy. It's a marvelous world, the world of food. I know. Are these potato pancakes? Or potato shred cakes? I don't think they're hash browns, because they are in cake shape. Oh, let's just call them good! yay! you found it! Glad to have you here. Thank you. I love how willing you are to try everything! I'm so glad I've found you. I LOVE your/the chef's recipes! Thank you. I can hardly wait to have time to explore your archives. Has anyone ever just baked these potato pancakes? I prefer not to fry things and would like to know if they're as tasty when fully baked. oh these are great! But they're even greater made into a sandwich with leftover roast lamb and tomato sauce... I just sliced one pancake in half, added the lamb, some salt and the sauce and then put the other half on top and heated it up and it is sooooo good! Thank you for the fabulous recipes and inspiration! I was feeling like it was such a drag to have to prepare all my own food, but I found your blog a few days ago and you've made me feel a little more excited about it. I have made these pancakes and the flourless peanut butter cookies so far and I'm a very happy girl! These beat out the asparagus-corn fritters I made for brunch this morning, and my two gluten-intolerant guests gobbled them down too. My mods: an egg to glue it all together - which just felt right, don't know how it would have stuck together without it - and skipped the corn starch. Instead of the corn starch, I reserved the liquid that drained from my potato squeezings. That liquid separated out into water and potato starch. I drained off the water and added the starch back in. Super yum! Thanks for the recipe, Shauna. In the last year, myself and both children have had to go gluten free as well as going without dairy, eggs, and a number of other foods. It's been such a challenge to find something the kids like, that I can make, and that we can eat without spending hours trying to prepare it. With the smallest substitution of potato starch instead of corn starch, I could actually use this recipe, and the kids loved it. They were just grinning like mad after they took the first bite. "Like giant tater tots, mom!" Thank you so much for posting this. Being able to find something tasty and quick these days is a real treat! Thanks for the great simply recipe. My first time making potato pancakes and they turned out fantastic! I read your book and it was a great guide to my new world of gluten free!